I’m well versed in how this adventure plays out using other rulesets. Castle Zagyg: The Upper Works was written for Castles & Crusades; its unofficial completion Castle of the Mad Archmage was written with AD&D 1E in mind; and the other seven times Eric, Joe, and I have run this adventure at conventions & the playtests thereof, we’ve used Lamentations of the Flame Princess and house-ruled AD&D. I was curious to see how using different rules would change the experience. In my previous experience with the DCC RPG (as a player at GaryCon and a DM at Fal-Con) we’ve played adventures written specifically for this system. I was interested to see how the feel of the game would carry over to a different scenario (Castle Greyhawk’s open-ended megadungeon vs. a Tomb of Horrors-style tournament-linear deathtrap). Can I get some details that distinguish the DCC RPG? Sure, but first some caveats! My experiences are based on a playtest version. Anything I talk about here may have changed by the time the game is released, and nothing I say should be taken as the official word; this is just my experience as a GM and playtester of the still-unfinished system. The most striking distinguishing feature that I saw emerging from the rules was that the DCC RPG is designed to generate unpredictability. (In part 2 I’ll address Gregor’s comment and talk about some other features of the game that emerge from other, non-rule aspects of the system). This is in marked contrast to the most recent edition of D&D, a stated design feature of which was a reduction in swinginess. Narrowing the range of variation in outcomes is useful for game designers concerned with balance, adventure writers concerned with being able to predict whether encounters will provide a level-appropriate challenge for a party of PCs, and DMs whose pre-planned campaign arcs make them concerned with things like ensuring the characters have enough resources left when they meet the Big Bad to make it a challenging fight, but not so many that it’s a cakewalk. However, many old-schoolers have pointed out that this increased predictability runs contrary to the sandbox spirit, which celebrates playing to find out what happens (as the new-school indie game Apocalypse World has it). We don’t want the heroes’ inevitable-but-just-barely triumph over the BBEG to be prearranged. We embrace systems that give players plenty of tools (from spells and magic items to referee adjucation of a clever idea) that can end or avoid a potentially grueling fight with a single action. And when a string of unusually high or low dice rolls turn a seemingly-manageable encounter into a bloodbath, we consider this not a failure of game design but an opportunity to demonstrate player skill by running away. The DCC RPG puts its money where its mouth is. 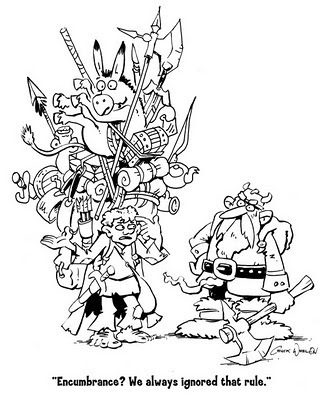 Although its mechanical core is derived from D&D 3E, the DCC RPG repudiates challenge ratings (that edition’s tools for making the outcome of an encounter more predictable), and offers more new ways for things to turn out in a completely unexpected way than any other retroclone or D&D variant I know. For starters, extreme dice rolls have more of an impact. There are awesome critical hit charts, whose “foe’s torso explodes like a blood blueberry” style is worthy of being called Rolemaster-esque (although which chart you use interestingly depends on character class rather than weapon type). Strangely I’ve never seen these come up in play, even though the fifth-level warriors in the Anonycon playtest were capable of scoring a critical hit against a one hit die foe on an unmodified roll of 16-20. Critical fumbles played a major role at the Fal-Con playtest, causing the friendly-fire death of at least one PC, but didn’t pop up in either of my Anonycon runs. The most important source of unpredictability at Anonycon came from the DCC RPG spell check mechanic, where you roll a d20 modified by caster level & ability score to determine the effects of the spell you just cast. A low roll might mean that the spell doesn’t have any effect; a high one can produce unexpectedly potent effects. Here’s an example from the second of the weekend’s playtest. Rather than confront these what WAS that things, Eric’s wizard decided to get the party into the room they’d just cleared and use the ward portal spell to keep the rats out. This is a classic old-school moment of swinginess: an ability available only to one character has the potential to end a fight before it even starts. 4E sees this as anathema – among other reasons, because an adventure designed around the expectation that this character can seal a door becomes unpredictable again if that character’s player misses a session – and so it eliminates the problem, first by making rituals like hold portal available to everyone who invests a feat and second by requiring them to take so long to cast that they can’t be used in a fight-or-flight situation. (Notably, folks interested in making 4E play more like 1E have reduced the casting time of rituals to a standard action). “OK,” I said, “you have enough time to get inside the room and cast before the rats are upon you.” Which is awesome; I love when players have choices that can radically alter a situation. And then the rules of the DCC RPG upped the stakes by tantalizing the wizard with the possibility of safe haven, but making it subject to the whims of fate: “Roll your spell casting check and let’s see what happens.” Drama hanging on the outcome of a dice – this is why I play RPGs! Eric rolled a 15: Portal completely disappears for 2d6 x 10 days, leaving in its place only a blank space of wall. During this time no passage is possible via normal means. Whoa! I’d been excited by the way the rules would adjucate a simple but dramatic yes/no. This result of the spell check mechanic turned it into the improv principle’s yes, but… now you’re sealed into a room with no visible exit for weeks on end! Everything that happened from that point on was hugely enjoyable for me as a GM because, just like a player, I was exploring the unknown; Eric and I were collaboratively working out the consequences of an imagined situation with no idea how it was going to turn out. “OK, give me a spell check,” I said, rubbing my hands with glee. I’ll talk about what ensued as a result in part 2 of this playtest report, where we talk about color and non-rule aspects of the system that influence play. With this post, my interest in the DCC RPG just increased significantly. I predict the stuff I have to report in Part 2 will also be to your liking! These are the exact ideas missing from 4e (and which I’m trying to put back into the game in my Legends & Labyrinths house-rules set, as you mentioned)! Can’t wait to hear Part 2! I’d written some Dungeon Crawl Classics adventures for Goodman Games, and I’m even more interested than ever in checking out the DCC RPG. Excellent post! I can’t wait to hear more about how CotMA fared in play. And rat kings? Viked for the Adventures Dark and Deep Bestiary. You betcha! @George: I didn’t know you’d done DCC adventures! Which ones? Warning: I will make you sign ’em for me! @Joseph: CotMA has, over nine runs, been consistently excellent. It’s more proof that I’m not very good at reading a module, or that good modules don’t read well, because on paper I hadn’t known what to think of it but in play it has really rocked. Particular high points from the Fal-Con runs were a room on level 6 with a trapper – I decided to put some treasure underneath the thing, since the players thought to look and it sweetened the deaths of several PCs to a classic F-you monster – and a wandering monster encounter which I adjucated by finding a lower-level room and having the inhabitants come up the stairs: 30 stirges! The lead PC (Eric again) ran as soon as he saw them; everyone else got swarmed (I used butterfly hair-clips as stirge minis, and limited them to 4 stirges per PC because previous experience with stirge-themed adventures in the Behemoth3 days proved that’s as many as you can clip onto a figure before it falls over). One fast-thinking magic-user realized the only hope for anyone to survive was to cast fireball centered on himself (despite the fact he only had like 5 hp left). Since LotFP:WFRPG handily reminds you that a fireball fills 33 10′ cubes, we had a great time marking map squares to see whether Eric’s PC had gotten far enough away to avoid the blast… nope. In the last run at Anonycon, with five minutes left on the clock he was at the series of doors with wights; I had heard Rob Kuntz tell that story at Gary Con, so I took great relish in relating it to Eric and saying how awesome it was that his PCs would also be saved by the bell if they made a saving throw – but he said “no wait I have a plan!” and managed to escape in the like two minutes left at that point by winning initiative, using ward portal again (this time getting an even better result, so that the portal sprouted demon fangs and bit the hell out of the pursuing wights) while he tunneled through yet another wall to reach known territory and thus the surface. Thank you, Tavis! I also look forward to the second episode of this summary. How efficacious were the party members across rule systems? Where is the lethality in this system? What are your restrictions for running this playtest ruleset again? Are you able to? Critical hit charts + unpredictable magic means this may well be my ideal D&D variant. I’d say that the parties were roughly equal in efficacy across rule systems, although it’s hard to say because the megadungeon is so huge and open-ended that each group encountered very different threats. The most impressive magic in the LotFP runs were fireballs, whereas ward portal was the star of the DCC RPG. I think this may be because a) wizard spells were chosen in the former but rolled randomly in the latter and b) the DCC spell check mechanic allows more flexibility in what you cast than memorized spells; both a & b encourage utility spells to shine. The kindness of the dice also makes it hard to compare PC efficacy; at Fal-Con, players really seemed to have rolled terribly for their PC stats & their bad luck continued in combat, leading to a Three Stooges Meet the Dungeon kind of slapstick, while the Anonycon players were better rollers & consequently had more heroic parties. The lethality is in the adventure design. The first time I played the DCC RPG, our party of zero-level characters was entirely wiped out; it was the same kind of gauntlet scenario, and evil game show fun, as Jim Ward’s Metamorphosis Alpha session, which is to say a historically long-standing and entertaining kind of old-school play but not at all what I’m used to. Using the Zagyg/Archmage megadungeon, the rules lent themselves beautifully to the same kind of exploration-based play we’d had with the LotFP system, and the DCC parties actually had fewer casualties (likely just due to differences in the ways the scenario played out). Sure, I’d love to run some DCCRPG again – I have a couple of adventures written for the system to playtest, and would also be happy to keep experimenting with converting scenarios written for other D&D variants. Joseph Goodman says “DCC RPG is slated for release in November 2011.”. He may still be looking for playtesters, you might try posting at the forums that quote links to! Post two of playtest, plz?